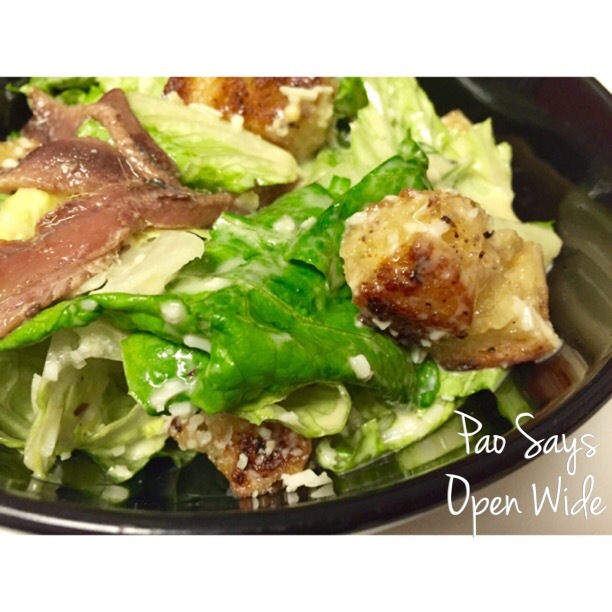 From Scratch: Caesar Salad with Anchovies – Pao Says, "Open Wide!" I’ve had many a Caesar salad, as I’m sure many of you have. But I’ve been meaning to try a go at making my own dressing from scratch, so when I found his Bon Apetit recipe, I knew I had to try it. I love how the dressing turned out- that classic Caesar flavor but not as incredibly thick as some of the dressings you may see. If you don’t like (or have never tried) anchovies, just give them a chance. They really make this dressing. If you like anchovies, like yours truly, toss a few fillets in your salad once you’ve assembled it! The other star of this salad was the homemade croutons. Basically, don’t even bother making this if you’re just going to throw in some store-bought croutons… If you commit to making a home made Caesar salad, you gotta go all the way! I improvised a bit on the croutons but I think I totally nailed it… If I am to believe my husband, that is 🙂 the recipe calls for just olive oil, but I also drizzled in a bit of the olive oil from the anchovies (just trust me on it), and I added some dried Italian herb mix (Rosemary, basil, parsley…), and a bit of garlic powder. Chop together anchovy fillets, garlic, and pinch of salt. Use the side of a knife blade to mash into a paste, then scrape into a medium bowl. Whisk in egg yolks, 2 Tbsp. lemon juice, and mustard. Adding drop by drop to start, gradually whisk in olive oil, then vegetable oil; whisk until dressing is thick and glossy. Whisk in Parmesan. Season with salt, pepper, and more lemon juice, if desired. Make your own. Tearing, not cutting the bread ensures nooks and crannies that catch the dressing and add texture. Preheat oven to 375°. Toss bread with olive oil (+1/2 tsp anchovy olive oil) on a baking sheet; season with salt and pepper (+Italian herbs, and garlic powder). Bake, tossing occasionally, until golden, 10–15 minutes. Use whole leaves; they provide the ideal mix of crispness, surface area, and structure. Caesars crowned with a mound of grated Parmesan may look impressive, but all that clumpy cheese mutes the dressing. Instead, use a vegetable peeler to thinly shave a modest amount on top for little salty bursts. Skip the tongs. Use your hands to gently toss the lettuce, croutons, and dressing, then top off with the shaved Parm. **this is a dish I like making the day after I buy rotisserie chicken- I shred the leftover chicken over the salad for a bit of added protein!